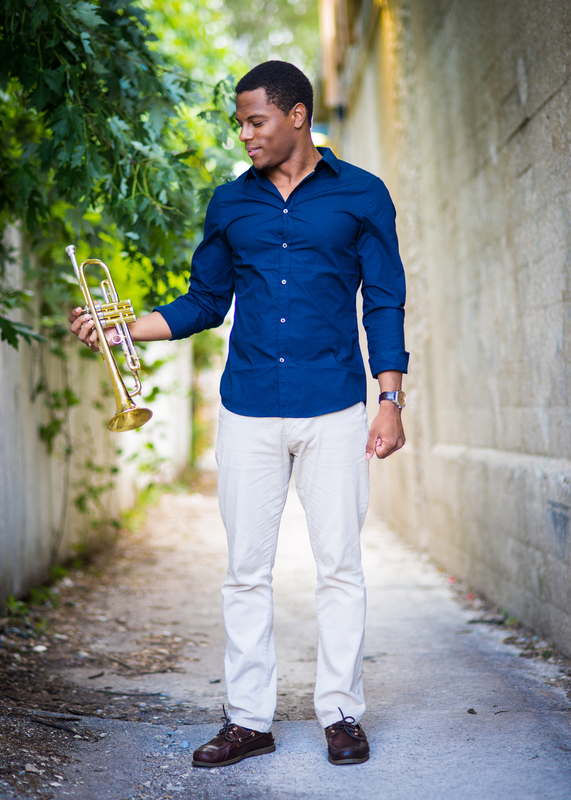 JUSTIN COPELAND IS A TRUMPET PLAYER, PIANIST, EDUCATOR AND COMPOSER BASED OUT OF THE CENTRAL VALLEY CITY OF FRESNO, CALIFORNIA. HE HAS BEEN PERFORMING EXTENSIVELY AS A PROFESSIONAL MUSICIAN FOR THE PAST 10+ YEARS ALL OVER THE UNITED STATES, AND CURRENTLY RESIDES IN THE CHICAGO AREA. JUSTIN COMPLETED A B.A. IN MUSIC PERFORMANCE AT CALIFORNIA STATE UNIVERSITY, FRESNO (FRESNO STATE) IN 2011, AND SUBSEQUENTLY An M.M. IN JAZZ STUDIES AT NORTHWESTERN UNIVERSITY IN JUNE OF 2013. THROUGHOUT THE RECENT YEARS, HE HAS HAD THE PRIVILEGE OF PERFORMING WITH AND LEARNING FROM many WORLD-CLASS MUSICIANS, LIKE SAXOPHONIST, COMPOSER AND EDUCATOR VICTOR GOINES, TRUMPETER, EDUCATOR AND COUNSELOR DR. MICHAEL CALDWELL, TRUMPETER AND EDUCATOR BRAD MASON, SAXOPHONIST, COMPOSER/ARRANGER, AND EDUCATOR CHRISTOPHER MADSEN, SAXOPHONIST AND EDUCATOR SHERMAN IRBY, TROMBONIST ELLIOT MASON, DRUMMER, COMPOSER/ARRANGER AND EDUCATOR RICH DEROSA, LEGENDARY BASSIST AND EDUCATOR RUFUS REID, LEGENDARY TROMBONIST CURTIS FULLER, WORLD-RENOWN JAZZ EDUCATOR DAVID BAKER, AND LEGENDARY SAXOPHONIST AND EDUCATOR NATHAN DAVIS. CURRENTLY, JUSTIN IS PURSUING A D.M.A. (DOCTORATE OF MUSICAL ARTS) IN JAZZ STUDIES AT THE UNIVERSITY OF ILLINOIS AT CHAMPAIGN-Urbana. JUSTIN HAS ALSO HAD THE PRIVILEGE TO PERFORM AT SOME OF THE MOST PREMIER HOUSES OF MUSIC, LIKE NEW ORLEANS' JAZZ CLUB, SNUG HARBOR, THE MAIN STAGE AT THE NEW ORLEANS JAZZ & HERITAGE FESTIVAL, The Riverfront Blues Festival (Wilmington, DE), The Little Walter Blues Festival (Alexandria, LA), THE CHICAGO JAZZ FESTIVAL, THE HOUSE OF BLUES CHICAGO, CLIFF BELL'S (DETROIT, MI), MERRIMAN'S PLAYHOUSE (SOUTHBEND, IN), DIZZY'S CLUB COCA COLA AT JAZZ AT LINCOLN CENTER (NYC), AND MANY, MANY OTHERS. Justin is currently playing with a number of different bands of different musical styles; his busiest one is the Gustavo Cortiñas Snapshot, with whom he most recently recorded a jazz album which was just released in June of 2013. Following the release of the album, the quintet embarked on a 3-week-long tour throughout Mexico City to perform at 20+ different venues and promote the album. Gustavo's ensemble was recently featured in May 2014 as a performing artist in the annual Next Generation Jazz Festival at the Drake Hotel in downtown Chicago where they performed the music from the record. The GCS just released their second album in the Winter of 2017. It is entitled "Esse", and it can be found on iTunes. Saxophonist Victor Goines has been a major influence on Justin's musical growth since he moved to Chicago in 2011, and has given Justin the opportunity to perform and travel in his company. Most recently, Goines recruited a small group of his former students to participate in wonderful educational collaboration in La Havana, Cuba in January 2016. Goines served as the director of education for a non-profit based out of New York City called Horns to Havana. The organization serves as a resource of musical instruments and repair techniques to its sisters schools in the city of Havana, as well as an infuser of American Jazz instruction by way of guest artists. The Goines-led group spent a week working with the young and talented musicians of the Amadeo Academy as well as La ENA, leading them through the spirit of Duke Ellington's music. The Dan Meinhardt Quartet is another group that Justin remains very active with throughout out Chicago. Comprised of Dan Meinhardt on tenor sax, Justin on trumpet, Tim Ipsen on bass and Andrew Green on drums, this group features a fresh combination of jazz, folk and contemporary improvisational style in their music. They recently recorded their debut album, which was just released in August of 2016! In addition, Justin is the trumpet player for Ft. Wayne, Indiana-based drummer Clif Wallace's Quintet. This group was featured as a weekly artist at Chicago's premier jazz venue Andy's Jazz Club from August 2013-December 2013. The band also had the honor of being a featured performer the 2014 Chicago Jazz Festival. Also, Justin has been very active with Fatbook, a 7-piece reggae/hip-hop/west-african/rock-influenced band that is quickly strengthening their national fan-base. Fatbook released their debut album, the self-titled "Fatbook", in July of 2014. The album is available for download on iTunes! Keep an eye on the official website listed below for upcoming shows and tours! Justin is also developing himself as an educator throughout the Greater Chicago Area and maintains his own private studio of students learning the fundamentals of the piano and the trumpet, as well as general music theory, classical repertoire and jazz studies. If you or anyone you know are interested in getting instruction in any of these areas, check out the "Contact Justin" link and send a message!